hen Rose was 16 and going on her first single date, she explained her theory of life to me. It was her response to my complaint that she was still too young. “What?” I shook my head to demonstrate my confusion and Janet started laughing, as Rose stepped through the front door and ran along the garden path towards the car parked on the kerb. I think about that day at this time of year and I think maybe she was right. Wise beyond her years. Life is a jigsaw, but how do you finish it when there’s a piece missing? Janet’s voice sounds young, like it did the first day we met 43 years ago. There’s a pause and I can hear her breathing on the other end of the phone. “How are you?” I ask to break the silence. “I’m good” She answers a little too quickly. “No” she says and before I can make a sarcastic remark, she adds that he’s coming home for lunch. I hear a sharp breath. The sound of anger. I don’t want to argue. Not today. I can hear a sob building behind her words as she speaks. I’d stopped praying a long time ago, the night the cops knocked on our door and said they’d found a body that needed to be identified. But it doesn’t cost me anything to say yes, so I do and hang up. I spend most of the morning cleaning the yard and when I’ve finished, I sit under the shade tree and drink a beer. It’s a beautiful day. A clear sky. A light breeze. Warm not hot. I close my eyes and I’m there again, watching Rose dancing through the sprinkled water and laughing so hard that she has to stop and catch her breath. Janet is telling her to come and sit down and I’m saying she’s a kid, let her play. She’s wearing a tee shirt with the Beatles on it. “Daddy’s band”, she yells slapping the wet faces of John and Ringo. Rose laughs and spins with her arms held out. Spins until she falls over dizzy and then she shouts. Car brakes squealing into the intersection at the end of the street, bring me back. I finish the beer and leave the empty bottle on the table, then check my watch. It starts raining about an hour in. I turn on the wipers and they beat out a tune. Oh yeah, I tell you somethin’…. I turn on the radio to drown it out and focus on the road, counting off the mile posts. The traffic’s light and I make good time. I reach the turn off around three and decide to have a coffee in a road side diner. I sit at the counter and ask for it black and hot. I shrug and she walks away, still smiling. I sip the coffee – stewed and strong, then take a bite. The sugar sits on my tongue for a moment then dissolves, but I can’t really taste it. I drain my cup and leave the half eaten do nut on the plate next to the second one. I leave a couple of dollars and change as a tip. Outside I stand next to my car and look at the message on the billboard in front of the battered chapel across the road. God says: Don’t make me angry. The rain has stopped and there is a corner of blue in the sky, but then dark clouds charge and it disappears. The chaplain is waiting for me after I clear security. “Bless you, ” he says, reaching out and squeezing my arm. He stares at me for a moment, wondering how to spark a conversation. He’s new and this is the first time we’ve met. The old man he replaced died during the year. Went to glory, according to the death notice. He’d been with me for the last five years, through the hands and feet. “The warden said he’ll meet you at the operating theatre,” the chaplain says breaking the silence. The young man nods and asks if there is anything more he can do. We walk through the prison, the sound of our steps bouncing off the polished floors and after a few minutes, the chaplain asks me why I do it. I think about the question for a moment then shrug. He looks at me, trying to work out if I’m serious. “You don’t strike me as a religious man,” he says. He leaves it there and we walk the rest of the way in silence. The warden is waiting in the viewing room and offers me a blessing as we shake hands. His heart doesn’t really seem to be in it, but he works for the government and you don’t keep those jobs in this State without being a bible carrying member of a congregation. I sit in the seat closest to the glass and stare into the operating theater. Sarcasm but after a few moments the voice fades away and the surgeon pinches open the right eye. He studies it, then looks up at the glass. The warden, stands in front of me, but says nothing. I shake my head. “Okay,” he says and walks over to the speaker on the wall. He presses the button. The surgeon nods and a nurse passes him forceps and a spoon. It doesn’t take very long, and afterwards the warden asks me if I’d like to come to his office for a coffee. He tells the chaplain that he’ll walk me out and we make our way to the gate, talking about how it’s been a cold winter and how the highway needs some money spent on it. At the gate he shakes my hand, but then holds it a little too long. I pull my hand away. I turn around without answering and walk out of the prison. I sit on the bed, staring at a Jeopardy repeat on the TV bolted to the wall. The rain sounds like fists beating on the roof. I think about calling Janet and look at the clock on the beside table. Too late, she’ll probably be at a prayer meeting by now. So I just sip at a can of beer, number 3 from the six pack I’d bought at the store, and wonder what they do with eye. For a moment, I imagine a room filled with little glass jars on shelves and floating in each one is an eye or an ear or a finger. I shake the image away and finish the beer in a single swig. I hit mute on the remote, put the empty can on the beside table and close my eyes. … she’s walking out the door, saying I won’t be late and there we are in bed, Janet reading, while I watch the clock tick over. She should be home. She’s a big girl. It’s almost midnight. Call her if you’re worried. I start to fall and when I stop, I am in the hospital, standing in front of a door with a sign telling me to stay out. I ignore it and step inside. In the centre of the room is a table, and on it there’s a body covered by a starched sheet. I walk towards it, my heels tapping on the concrete floor. The overhead light is humming. It’s not strong enough to clear the shadows crowding the corners. I stop at the table, and for a moment I hesitate, squeezing my hands into fists and digging the nails into my palms. Finally, I reach down and pull back the sheet. There are no surprises, no last minute reprieves. There never are. She is there, every piece of her, waiting to be put together again. Bart Meehan lives in Canberra Australia and has published several stories over the years. Bart has also written a short radio play about World War 1 that was broadcast on Australian radio and is now available for free download here. A second play on the London Blitz during World War 2, will be broadcast in the coming months. 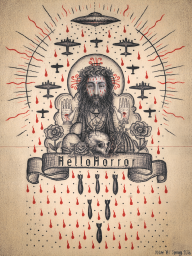 Bart's micro 40 Years and Counting appears in the April 2013 issue of HelloHorror and his story The Lesson appears in the Winter 2015 issue and The Last Words appears in the Spring 2015 issue of HelloHorror.